Orange and Magenta » MORE TEA, VICAR? Alan Ross is a retired radio broadcaster who now lives in North East England. A quick trip through the archives of this website will reveal a passion for many of the things that make life worthwhile—not least tea. And detective fiction, of course. My favorite Agatha Christie murderess could have been created specifically for Orange and Magenta. Miss Gilchrist, that genteel soul, had fallen on hard times due to the failure of her business. She is reduced to being the paid companion of Cora Lansquenet, a slightly dotty woman with artistic pretensions. Visiting a country auction, Cora acquires a painting by Vermeer without realizing what it is, let alone what it is worth. Miss Gilchrist, on the other hand, recognizes it instantly and soon dispatches her employer by means of six or eight blows to the head with a hatchet (as any self-respecting psychopath would do). In mitigation, m’lud, she had recently read that a Vermeer had made £5000 at auction and she had plans for the proceeds. The formidable Hercule Poirot unmasks her in front of the family of her late employer and they are quite naturally appalled. “You killed her—in that brutal way—for five thousand pounds?” Susan’s voice was incredulous. Miss Gilchrist turned to him. — Agatha Christie, After the Funeral (1953), Paul Hamlyn, London. As Christie fans may remember, Miss Gilchrist’s previous tea shop, The Willow Tree, had been a casualty of World War II rationing. In more recent (and nonfiction) times, tea shops had actually became something of an endangered species due to the global success of the high street coffee shop. First Starbucks, then British equivalents such as Costa Coffee and Caffé Nero, sprang up on every corner, starting in London and slowly making their way north. The drinks equivalent of McDonalds, Burger King, or KFC, these places serve a standardized, uniform product that many people like, as opposed to the quirky individualism of the Copper Kettle or the Cozy Corner Café. I don’t know of a global brand of tea shop to rival the international behemoths of the coffee world; tea shops seem to be much more individual in character. 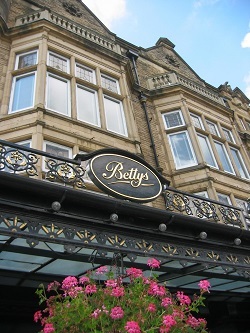 Even the celebrated Bettys has restricted itself to Yorkshire though of course their products are now available worldwide through the Internet. Most foreign visitors to Britain in the decades after World War II ventured no further than London and experienced afternoon tea in one of the many hotels, restaurants, department stores, and cafés. But even the capital saw the tea shop start to decline. By the early 1990s, if you still had a copy of Jonathan Routh’s Good Cuppa Guide: Where to Have Tea in London, which was published about thirty years previously, you would have searched in vain for many of the cafés and watering holes mentioned in it. Naturally, the more celebrated venues still thrived. The Savoy, Fortnum & Mason, Harrods, the Ritz, the Waldorf, Selfridges, and Brown’s were all present and correct. And they still are, but many others have disappeared. In the 1970s at a tea shop in Ide, a Devon picture-postcard village complete with thatched roofs, I remember cream teas where the jam and clotted cream came with a small individual cottage loaf instead of scones. Regrettably, a Google search seems to indicate that this establishment has gone the way of all flesh. Many daytrippers to Clacton-on-Sea in Essex in the 1950s and 60s would look forward to their afternoon tea at Cordy’s Restaurant. People would queue around the block to get in and waitresses in proper uniforms supervised proceedings. No more, alas. It was turned into a pub in 1999. Happily, the decline has not been terminal. Indeed, the British tearoom has staged a recovery. 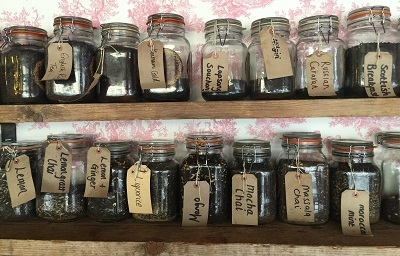 Social media and the Internet have put networking and publicity at the fingertips of individual tea shop owners, not just the big multinational firms. Give good service, attract an enthusiastic regular clientele, and your Facebook page, website, and comments on TripAdvisor will spread the word far and wide. Organizations and umbrella groups like the UK Tea & Infusions Association at www.tea.co.uk (a web address that must surely be worth a fortune) help keep standards high, and marketing ploys like “Afternoon Tea Week” fly the flag. 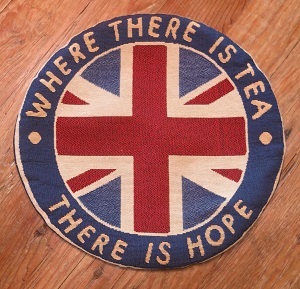 Talking of the flag—I think afternoon tea is once again becoming seen as a British icon. Many tea shops find a place for the Union Jack or the Cross of St George as part of their decorations or theme if they have one. I write this at a time when the United Kingdom has voted to leave the European Union, and the word “Brexit” has entered the vocabulary. The Union Jack has never been more prominent in the media. If Brexit does result in a more robust appreciation of our national identity, surely this can only be good for the tea shop, purveyor of a British tradition as opposed to the coffee shop, importers of a continental brew. 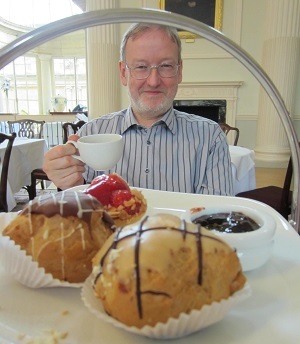 Establishments serving afternoon tea are certainly booming in North East England, where I now live, and where, in a previous article in these pages, I have encouraged those from abroad to visit. These places cater to every taste and pocket, some being traditional to the core, others providing a modern twist on an old favorite. We should start of course with the previously touted Bettys. The most northerly outlet of this marriage of Swiss and Yorkshire cuisine is in the pleasant North Yorkshire market town of Northallerton. Smaller than its sister establishments in York, Harrogate, and Ilkley, it has all the virtues of what is now really the Bettys “brand,” lost apostrophe not withstanding. Spotless table linens, impeccable cutlery, and tea services. Proper leaf tea. Sandwiches, handmade cakes, and freshly baked scones, all presented by staff who deliver customer service as it used to be—before it was replaced by the word “Enjoy,” hurled at you through gritted teeth. The basic Bettys afternoon tea comes in at £18.95. You can add Champagne for a total of £26.85. 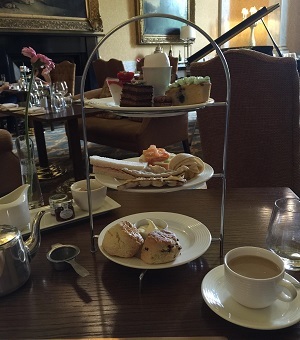 Recently they have introduced the concept of “Lady Betty Afternoon Tea,” which you can only get in York and Harrogate by reservation between Thursdays and Sundays. This adds a new blend of tea and two new types of scones for £32.95—opt for the Champagne version and you get five pence change from £40. Expensive, but you won’t find many people complaining; Bettys has iconic status with nearly a hundred years’ worth of success behind it. The aforementioned murderess, Miss Gilchrist, would definitely approve of Robineau Patisserie, 27 West Auckland Road, Darlington, “a nice neighborhood where nice people come in.” It’s in the village of Cockerton, which is “ladies-who-lunch” territory. The overheard conversation could range from Barbara Pym-like church committee plotting to enquiries about summer holiday plans in Cornwall or “the Italian villa you went to last year.” Afternoon tea features Taylors of Harrogate loose leaf teas and Robineau gets full marks for supplying a jug of hot water for refills. The sandwiches are splendid—poached chicken breast with smoked Wensleydale cheese and chilli chutney being one example. This is supplemented by a fresh choux éclair filled with smoked salmon and dill, a savory scone, and a brioche sandwich with oven-roasted ham and tomato chutney. Fancy a warm fruit scone with clotted cream, strawberry jam, and lemon curd? How about lemon and lime tea loaf, a raspberry and white chocolate meringue, strawberry tart, or honey and Victoria plum cheesecake? All included for £18.95 per person (with more expensive prosecco and Champagne options). There’s also a small lunch menu full of seriously delicious fare—and the service is as convivial as the surroundings with paintings from the proprietor’s family displayed on the walls and in a gallery upstairs. It’s all very nice. In fact, if Robineau had more outlets, rather than just the one, they would give Bettys serious competition. Note to those who might visit: a patisserie counter with artisan breads, cakes, and pastries will tempt you as you leave. There are many varieties of more down to earth afternoon teas and two of the best in this part of the world have a definite World War II theme. Remember Me Tea Rooms, 5 Finkle Street, Stockton-on-Tees, is the brainchild of Claire Church, who has been running it for three years. The café, just off the busy high street, is filled with memorabilia including newspapers with headlines about things like Hitler’s demise. Moreover, the menu is designed to look like a ration book but you won’t find spam, snoek, or Woolton Pie on it (thank goodness). Instead there are the usual café favorites of baguettes and toasties, and the afternoon tea is a real bargain. £7.50 gets you a full-size sandwich, a cheese or fruit scone with jam and cream, side salad, crisps, and a choice of cake. The tea is from teabags, and not loose leaf, but you can’t beat the value at the price Claire charges. It’s very much a local favorite. Seaton Carew is an old-fashioned seaside resort of the kind that seems always to be on the point of expiring, but never actually does. It achieved national notoriety a few years ago due to the fraudulent antics of one John Darwin and his wife. John had been missing, believed drowned, in a canoeing accident in 2002. He had, however, been hidden by his wife in the family home, while she claimed on his life insurance policies. The plan was for them both to eventually escape to Panama where they had a property. However, the strain on the marriage proved too great. John walked into a London police station in 2007 and the game was up. They were both imprisoned, and a prankster erected a road sign saying “Welcome to Seaton Canoe—twinned with Panama.” Some think it was churlish of the local council to remove it. 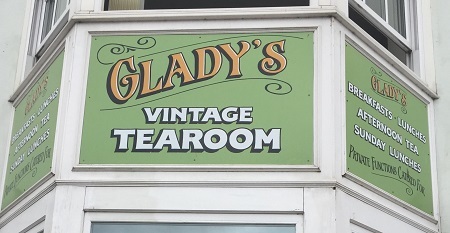 Occupying a good position on the sea front at this beloved resort is the family run Glady’s Vintage Tea Room, 35 The Front, Seaton Carew, Hartlepool. This takes the World War II theme even further to the extent of the unisex toilet being kitted out like an air raid shelter complete with cut up copies of the Daily Mirror as substitutes for toilet paper. (There are proper loo rolls as well, you’ll be happy to learn!) They offer the local firm Rington’s loose leaf teas with their afternoon tea, coming in at a tasty £9.95—finger sandwiches, scone with cream and jam, and three small dainty fancies. You will want to leave room for a slice of one of their homemade cakes—the ubiquitous Lemon Drizzle cake is particularly good. This is a very likeable operation, deservedly much loved by the locals. Unlike Bettys, who have dropped the apostrophe, Glady’s have kept theirs, albeit in the wrong place! Also in a seaside resort but away from the coast itself, you’ll find the Valley Gardens Tea Rooms, Rose Walk, Saltburn-by-the-Sea. When you’ve enjoyed your walk along the front and pier at Saltburn as afternoon approaches, head for the Valley Gardens. Though beautiful, it’s quite a hike to the tearooms, but you are in luck if it is a summer day during the school holidays as the miniature railway will transport you there. Alternately, you can walk to the tearoom, and then get the train back after you have had your fill of homemade cakes, Beacon Farm ice cream, and, of course, a refreshing cup of tea. The real plus of the Valley Gardens Tea Rooms is the location, which is great for families and has been enjoyed for decades: their website boasts a photograph of the tea rooms from the 1930s — much smaller, but still recognizable! Another likeable seaside town tea room is further up the coast on Tyneside. Jolie Rose Vintage Tea Room, 39 Westoe Road, South Shields, is very “vintique” in style—lots of reconditioned, repainted, previously cherished furniture, and pastel colors. This is quite a new venture, and suffers a little from its location in the town. If it were on the seafront, it would be packed from morning until night during the season. However, once you get inside the 70s aluminum entrance door, it has great charm. Afternoon tea for two is £15.95 and has to be booked twenty-four hours in advance. Our next stop on this specialized itinerary is Sedgefield, a destination that horse racing devotees will know because of the racecourse on the outskirts of town. But it is in the small town centre that you will find the pretty exterior of the family-run Number Four Teashop, 4 High Street, Sedgefield, County Durham. The front of the shop is a very busy patisserie, with cakes, flapjacks, and savories, together with a large range of pickles, jams, and marmalades. Fight your way into the café section and you will find the menu has more varieties of sandwich than you could possibly imagine. The afternoon tea is a substantial meal, competitively priced at £11.95. You get a selection of sandwiches, including ham, egg mayonnaise, tuna, and salmon and cream cheese. Unusually you also get a hot sausage roll which is followed by a fruit scone with butter cream and jam. Number Four gets extra marks for the butter being spreadable, unlike many places which provide the little packets straight from the fridge, frozen solid. Three cakes complete the meal, a meringue nest, a strawberry flan, and a caramel flapjack, all of which are temptingly available for sale from the counter at the front as you leave! If I am confident about the ability of the British tearoom to attract each new generation to its charms, these next two establishments are great examples of how it can thrive. There’s a similar vibe though in a more affluent setting at Cafédral, 1 Owengate, Durham. If you’ve left the car at one of the Durham Park and Ride centers, taken the bus into this ancient cathedral and university city, climbed the hill and done the tour of the cathedral, you’ll be ready for a heart bypass operation or at the very least a cup of tea. You would probably miss this endearing little tea shop on the corner if it weren’t for the beautifully chalked blackboards outside their small courtyard. Upstairs you’ll find a tea room furnished in the manner of a slightly psychedelic 60s apartment kitted out from the cast-off furniture of a bigger house. The overall effect is of a hippie commune, but don’t be fooled—these people know exactly what they are doing and they even (unusually) take American Express! 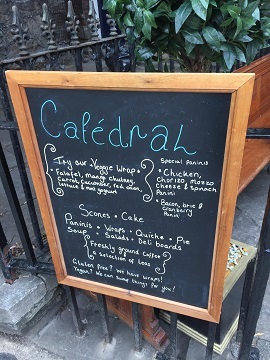 It’s great fun, the food is good value, the service nicely judged, and the scones are particularly good. But just what is it with puns? Staying in Durham but having just come away from Cafédral, I give you Tealicious, 88 Elvet Bridge, Durham. This choice of name, however, is not unique—indeed there are Tealicious tearooms in York, Haxby, and Chelmsford and even one in Bangkok according to TripAdvisor. 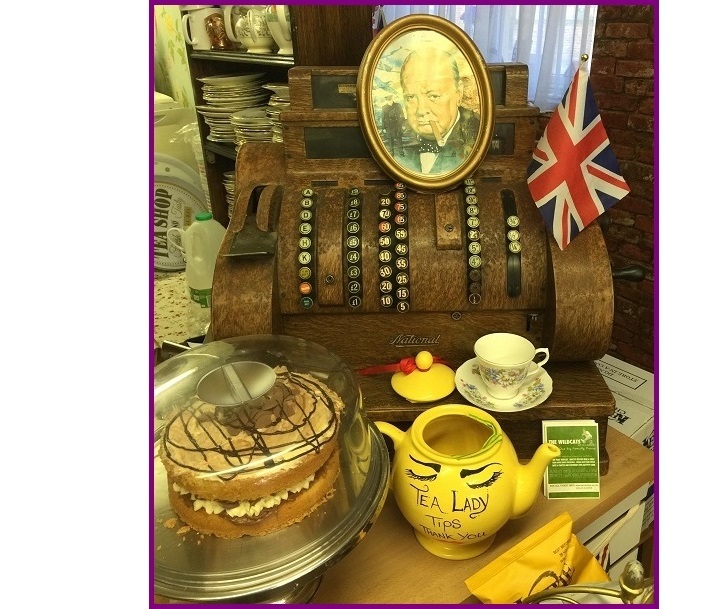 Alison, the owner, reported that she had reassessed her life on her fortieth birthday, and decided that she wanted to leave the education profession to start a “proper” tearoom. Her location could scarcely be better, and the café is always packed. Afternoon tea has to be ordered forty-eight hours in advance, is served Wednesday to Saturday, and costs £16.95. It contains all the usual things, including a fruit and a cheese scone. Less well known than Durham, but just as worthy of a visit, is the pretty market town of Barnard Castle, with interesting local shops, antiques, and the stunning Bowes Museum’s permanent and visiting exhibitions to enjoy. The most famous resident of the museum is the mechanical silver swan that “struts its stuff” every afternoon at 2 pm after it has been wound up with an ancient key. Back in the town itself you’ll find Clarendon’s, 29 Market Place, Barnard Castle, County Durham. This restaurant is another one with a “vintique” feel to it, with glass topped wicker tables and comfortable built-in seating by the windows. The décor is a little eccentric—the white painted imitation stag’s head and multitude of white frames and mirrors may not be to everyone’s taste, but the food certainly will be. The afternoon tea features “Mad Hatter tea”—in teabags—and at £11.00 gives you a nice selection of sandwiches including smoked salmon and lemon mayonnaise, brie and cranberry, ham and English mustard, and cucumber and cream cheese. There’s a pre-prepared fruit scone with clotted cream and strawberry jam, a slice of one of their cakes, and a miniature lemon posset and fresh fruit pavlova. You can add an individual bottle of prosecco for an extra £5.75 All in all, very acceptable and good value. So far, the afternoon teas featured have ranged from the inexpensive to the mildly extravagant, but what if you want something quite special? Say a celebration of some sort or other? Try heading toward the Millennium Bridge, the impressive pedestrian swing bridge that links Newcastle to Gateshead, and there you will find the upmarket four-star hotel Malmaison, 104 Quayside, Newcastle-upon-Tyne. Upon arrival, make your way upstairs to the first-floor brasserie where they serve afternoon tea for £17.50. This meal boasts a modern twist, replacing the traditional sandwiches with delicious wraps of hot smoked salmon, chipotle chicken, and a mini burger and it all works surprisingly well. The Taylors tea is provided in teabags, but everything else is as you would hope, with a fruit scone, strawberry and vanilla pavlova, salted chocolate brownie, lemon and polenta cake, peach and Amaretto cream, and a frozen summer berry smoothie. To continue the modernist treatment, all this deliciousness arrives on an oblong two-tier slate, not the traditional cake stand. Malmaison offers two types of Champagne, but also four different cocktail afternoon teas at £25, and the one to go for is “Hendrick’s G & Tea.” It is a delicious cocktail based on the preferred gin previously extolled on this website, served in a Hendrick’s cup, complete with a floating paper butterfly. If you want to be pampered in a modern setting, this is a good place to choose. Turn right off the road between Stockton and Sedgefield, follow the signs, and you’ll arrive at Wynyard Hall’s imposing park and grounds. Eventually you will come to the gravel drive and the entrance to what was once an impressive country house and is now an immaculately restored hotel and conference centre. Wynyard Hall, Wynyard, Billingham. Several tweaks to their traditional afternoon tea make this destination particularly interesting for this report. Served in the Wellington Room, you’ll find samples of the leaf teas available in little transparent containers in the menu itself. The opulent afternoon tea (£21.50) comes with what looks like a boiled egg dessert, but is actually a passion fruit smoothie with a ginger puree “yolk.” One may also add the usual alcoholic additions of prosecco, Champagne, and rosé Champagne, the latter bringing the price to over £30. You might want to try the Gentleman’s Afternoon Tea, but do book this in advance—they had run out of it on the day I visited. If all of this seems rather too much, they offer a basic cream tea for under a tenner. This is afternoon tea on a grand scale, befitting the historic house that hosts it. And an even more prestigious historic house is our next destination. 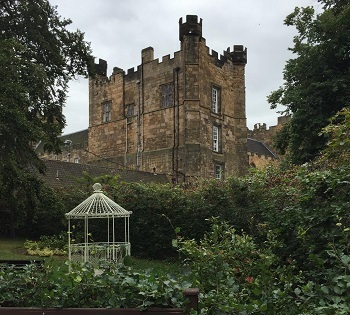 Lumley Castle, Chester le Street, County Durham is a fourteenth-century castle, named after its creator Sir Ralph Lumley. It also now runs as a hotel and offers a wonderful medieval atmosphere. You wouldn’t be surprised to find a knight in armor patrolling the endless passageways and corridors. The whole place resonates of “Merrie England” with oak panelling and staff costumed suitably. Afternoon tea starts at £14.95, with the usual selection of finger sandwiches, fruit scone, and cakes. Pimms Afternoon Tea (recommended!) is £18.40, prosecco £20.95, and Champagne £25.20. Lumley Castle has a style all of its own and it is delightful. Our last stop for tea has become a regular haunt of mine several times a week since I discovered it via TripAdvisor last year: The Elmwood Tea Room (in the Elmwood Centre) 53 Darlington Road, Hartburn, Stockton-on-Tees. Run by married couple Gill (cook) and Ken (front of house), this is only open on weekdays, and is closed during school holidays. Its popularity is such that most days at busy periods you will have to queue since they only run to about nine tables, each with their own pottery cruet of birds or hedgehogs. Afternoon tea at £7.50 includes a finger sandwich, fruit scone with homemade jam or lemon curd topped with cream, choice of cupcake, and pot of Rington’s tea in their branded “classic patterned” teapots. There’s a full menu of sandwiches, paninis, toasties and soup—all excellent but especially the broccoli and Stilton soup, which is superb. To spend an hour or two at the Elmwood is to relax and count your blessings. Miss Gilchrist herself would have adored it! Yes, whatever happened to Miss Gilchrist, the demure woman who was willing to kill in order to realize her dream of opening a proper tea room?